Do you recognize any of these boys? 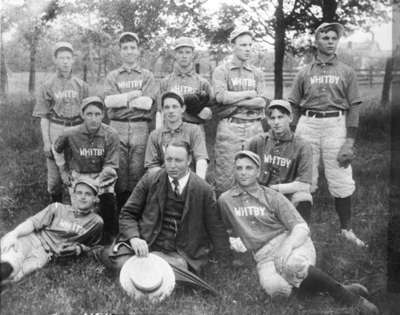 Black and white negative of a photograph of a Whitby baseball team posing for a photograph in a town park. Back row: unidentified, David Mowat, unidentified, Charles Barton, unidentified. Centre row: unidentified, unidentified, Arthur Blanchard. Front row: unidentified, Albert Jackson, David W. Megaffin. This photograph was printed in the Toronto Sunday World on 18 August 1907. Whitby Baseball Team, 1907, George I. Wilson. Whitby Archives 21-004-005.